Below the latest Stage Accompany news. Stage Accompany will be there !! "Big" Mick Hughes, live audio engineer for Metallica (a position he has held since 1984) and many others, was impressed of the amazing ribbon sound quallity of Stage Accompany at the Prolight & Sound 2015. "Big" Mick in the middle of the picture with SA R&D manager René van der Laan (right) and SA Sales manager Gerard Vermeulen (left). 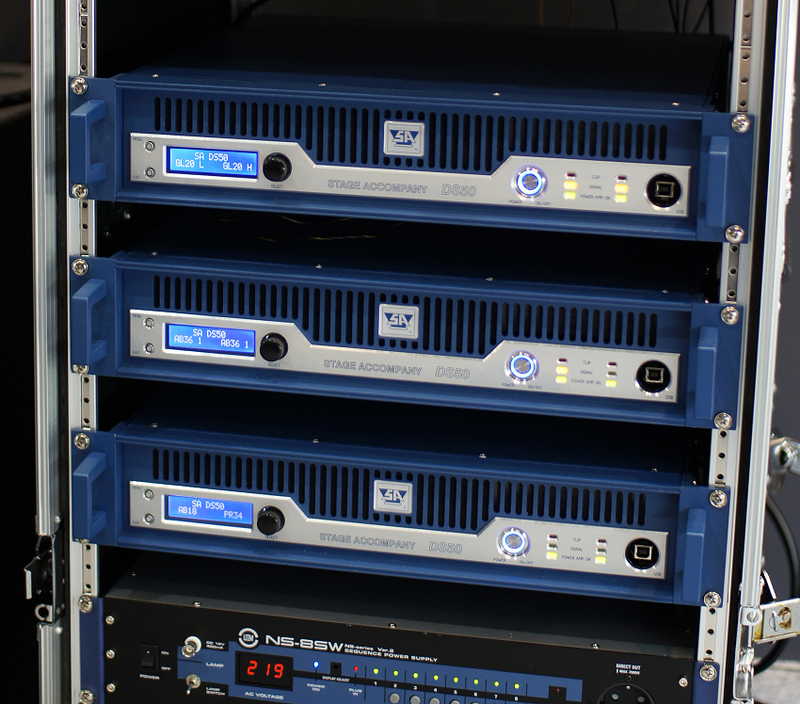 Equipment: 1 x AB36 Audience Series, 6 x C24 Champ Series and Efficiency Series. 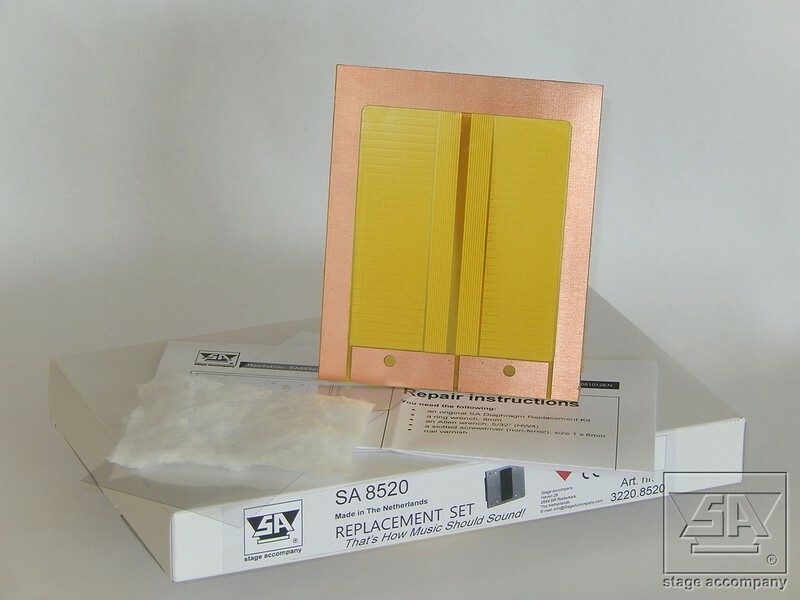 SA8520 replacement diaphragm again in production. From now on films will be played every Wednesday in this beautiful theater. The cinema is equipped with 50 cinema seats and a great Stage Accompany BV cinema sound system. 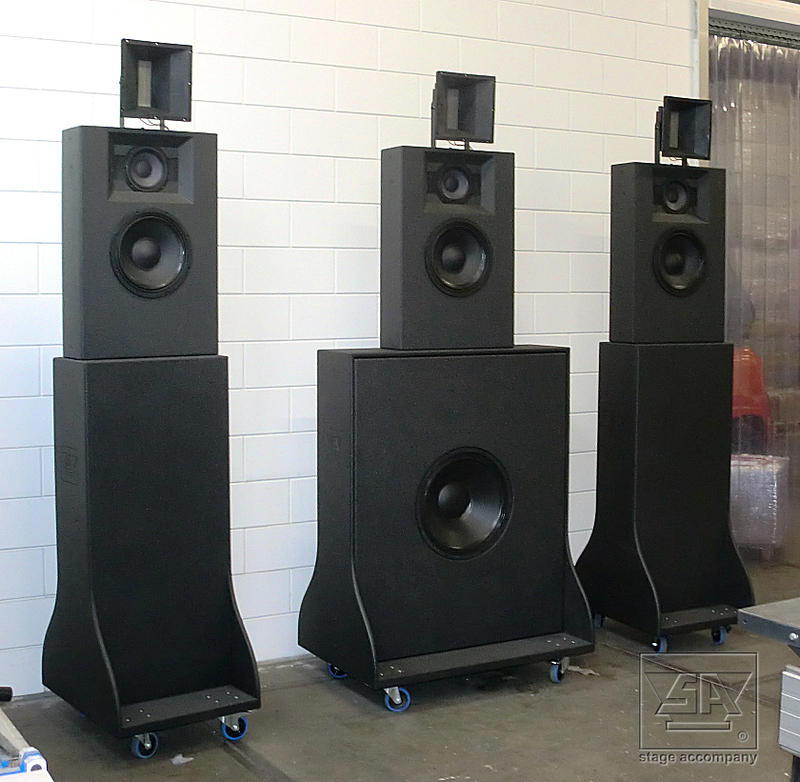 The Stage Accompany cinema sound system exist of S31, SL18 and S5 enclosures of the SA Screen Series. 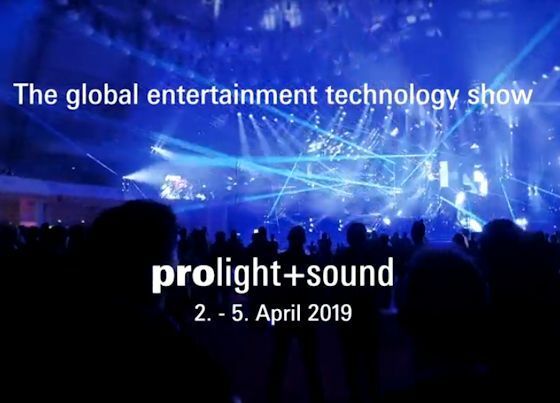 Stage Accompany will be at the Prolight + Sound 2014 International Fair of Technologies and Services for Events, Installation and Production. A complete new cinema system has left the Stage Accompany factory. 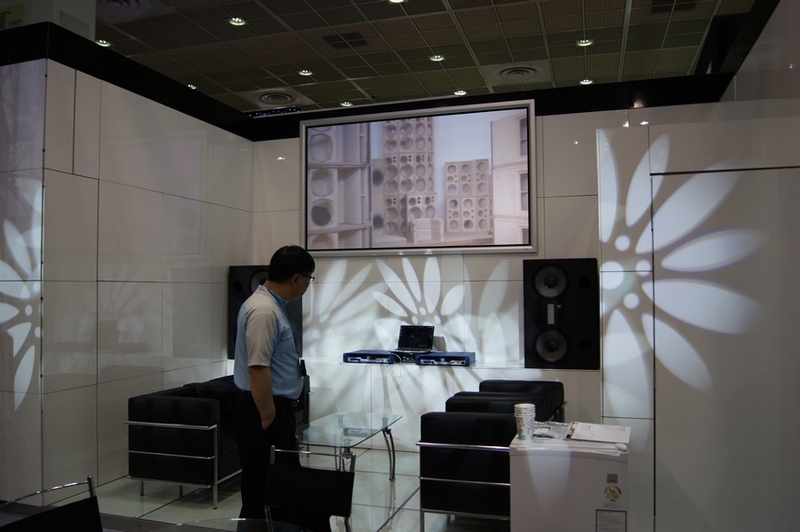 This phase linear system consist of three S31, one SL18 and six S5 enclosures. The custom build transportable cinema system was build for Islemunda, podium van Ijselmonde, at Rotterdam, The Netherlands. The SA Screen Series has been extended with three new enclosures, namely: S31 (phase linear, 3-way, full-range), SL18 (18", ultra-low, subwoofer) and the S5 (wedged, compact, surround). 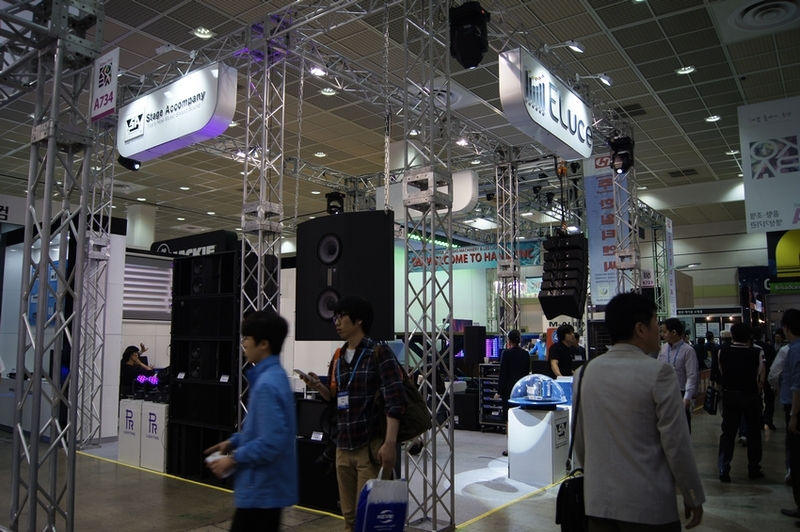 Our SA-Partner, El Luce, will be showing Stage Accompany equipment at the Kosound+Stagetech 2013. 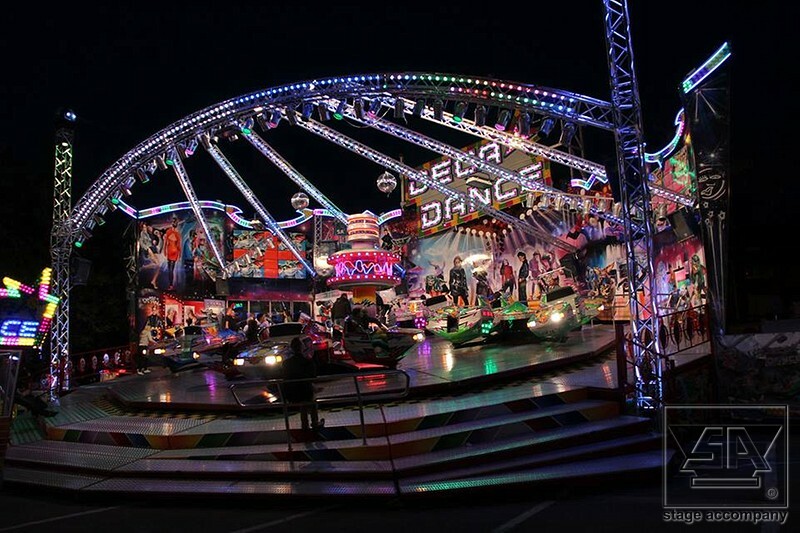 The fair will be held on 2013.11.6 (Wed) till 2013.11.8 (Fri). The Breakfast Experience Pajama Dance Party. 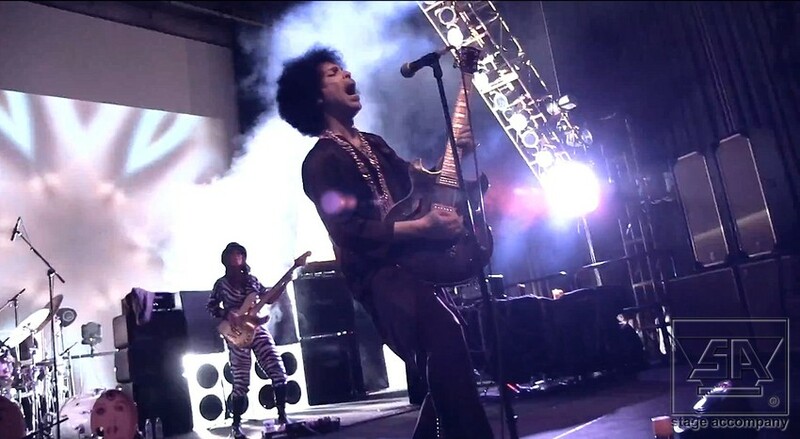 Prince and 3rdEyeGirl, featuring Donna Grantis, did use the 17 year old Stage Accompany P2-26 Performer sets (which are a piece of Prince history) on the pajama party at the Paisley Park Studios. Prince to open his house for public concert. 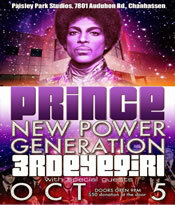 "Prince New Power generation 3rdEyeGirl"
Prince and 3rdEyeGirl, featuring Donna Grantis, did use the 17 year old Stage Accompany P2-26 Performer sets (which are a piece of Prince history) on the concert at the Paisley Park Studios. The SA Performer sets were nearly two years ago overhauled by Rob Kruger, audio engineer at Paisley Park Studios. Stage Accompany has started delivering the updates of the Stage Accompany sound systems in the Pathé movie theaters in The Netherlands. 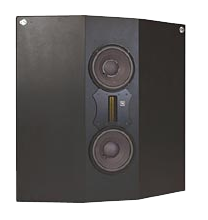 The update consists of adding additional SL15 and SL30 woofers from the SA Screen Series to the allready existing SA installations. With this update Pathé can keep up with the current cinema techniques and requirements, and can therefore bring the audience the ultimate Stage Accompany cinema sound (with ribbon technology) for many years to come. 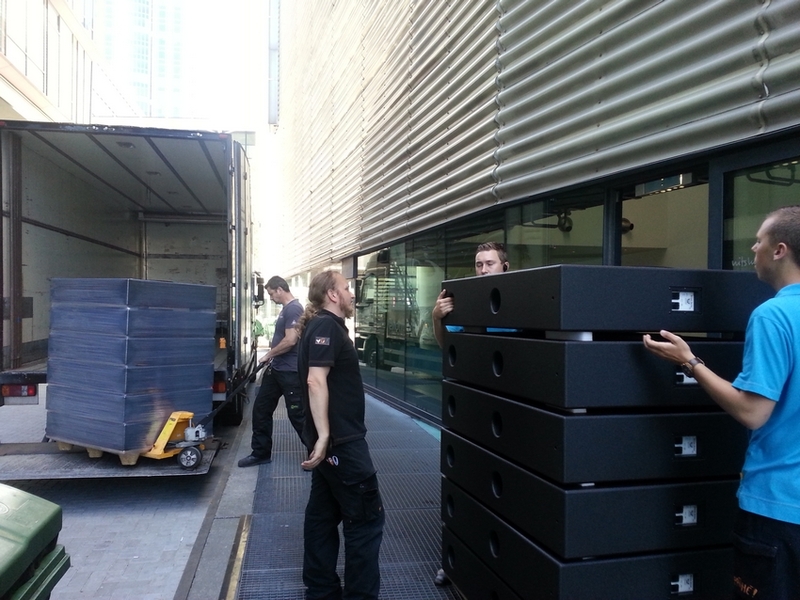 The following two pictures show the delivery of the twelve SL30 woofers at Pathé Schouwburgplein (Rotterdam, The Netherlands). Koba Show 2013 Seoul, South Korea. 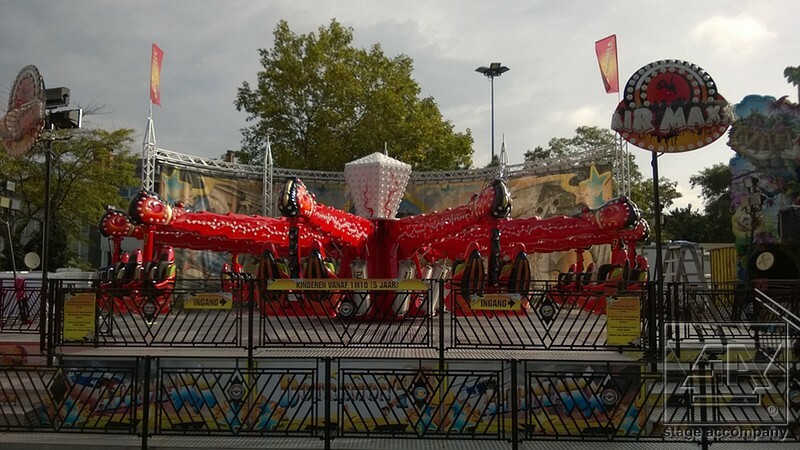 For the second year successively Eluce and Stage Accompany presented the new SA products. 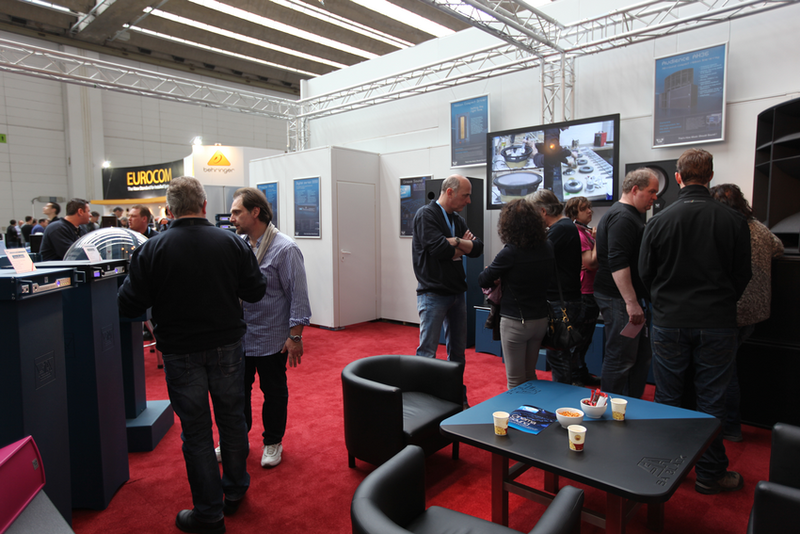 The new SA amps; DS20 (little brother of the DS50), HE50 (High-End) and SSD420 (Cinema) were on display. 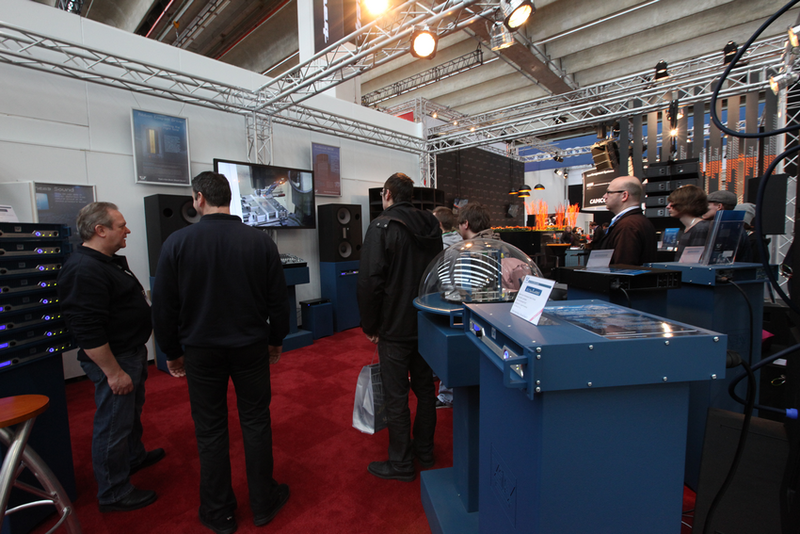 The unbeatable combo M57/DS50 made a big impact to the visitors. Stage Accompany movie (on screen) with the famous Blue Box. Genesis Small Line Array with AB36 (left) and Prompter PR34 with AB18 on display. Overview Eluce Stage Accompany stand. Four AV27 with AB37 (left) and SA Screen Series (right). 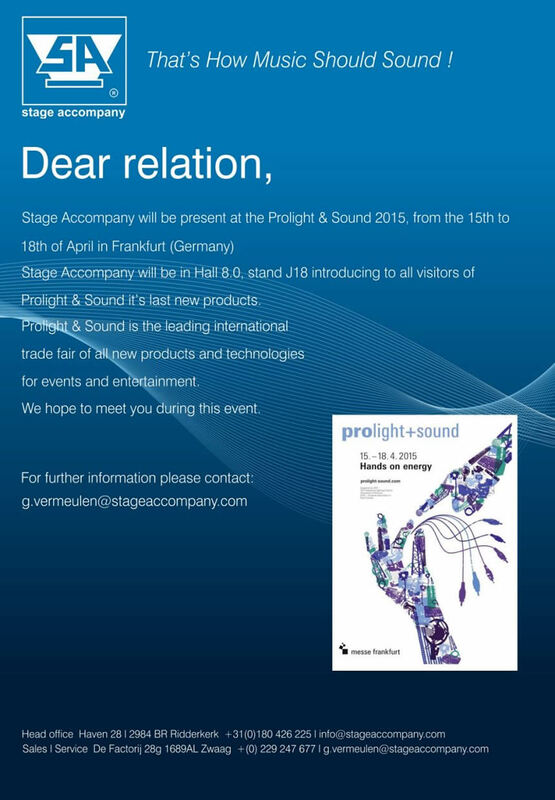 Stage Accompany again enjoyed a very busy and successful Prolight+Sound exhibition in Frankfurt, Germany. Products highlighted included the new digital amps; DS20 (little brother of the DS50), HE50 (The first High-End and High-Power amp in the world) and the SSD420 (4-channel cinema amp). 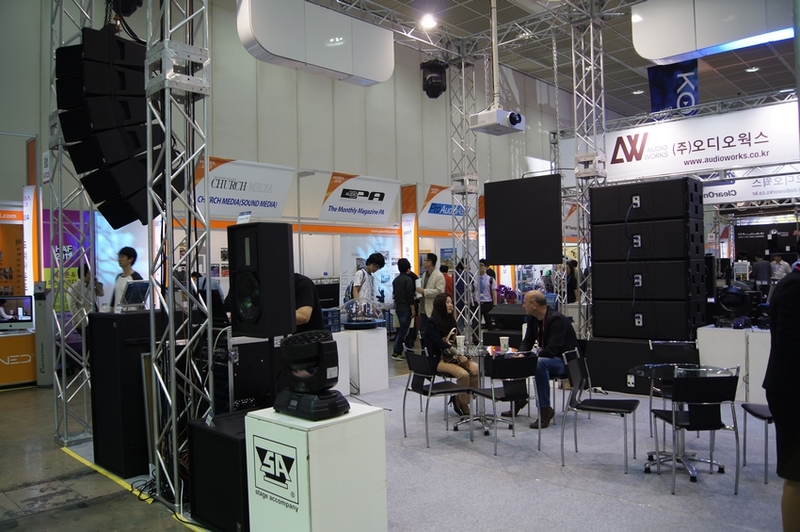 On display were also the SA Audience Horizontal Line Array (4 x AH36, 4 x AB36), the large SA Audience Line Array (1 x AB37, 4 x AV27), Genesis Small Line Array (1 x AB36, 4 x GL20b) and more. The M57 set in combination with the DS50 amps was a great success, still the best sounding set ever build. 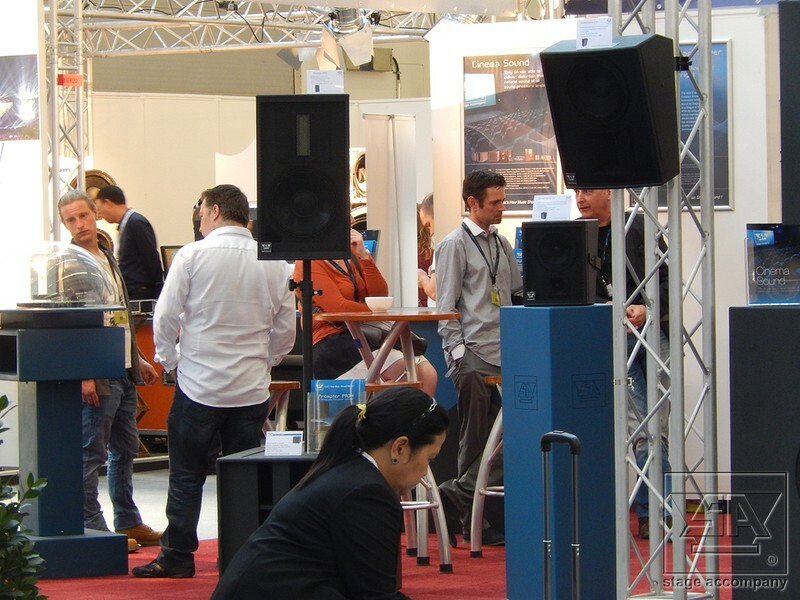 Remi (left) and Bas (right) talking to each other nearby the large SA Audience Line Array stack, 4 x AV27 and 1 x AB37. René van der Laan (far left) and Gerard Vermeulen (3rd form the left) talking to Stage Partners from Italy. 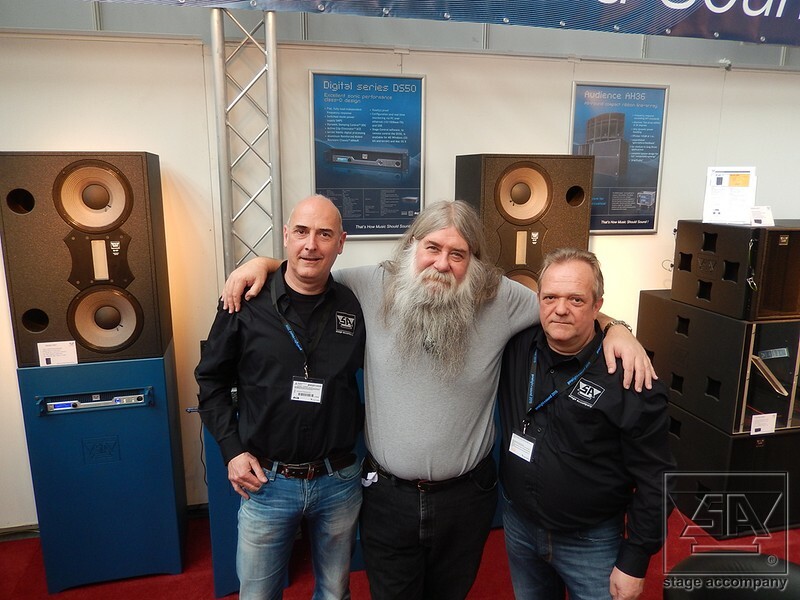 Again René van der Laan (left) near the SA Genesis Small Line Array stack, 4 x GL20b and 1 x AB36. 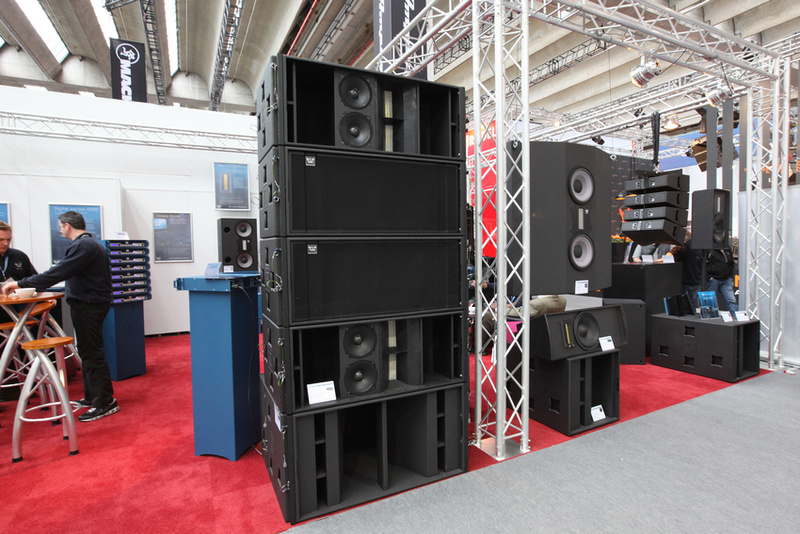 The M57/DS50 set and a part of the SA Audience Horizontal Line Array. 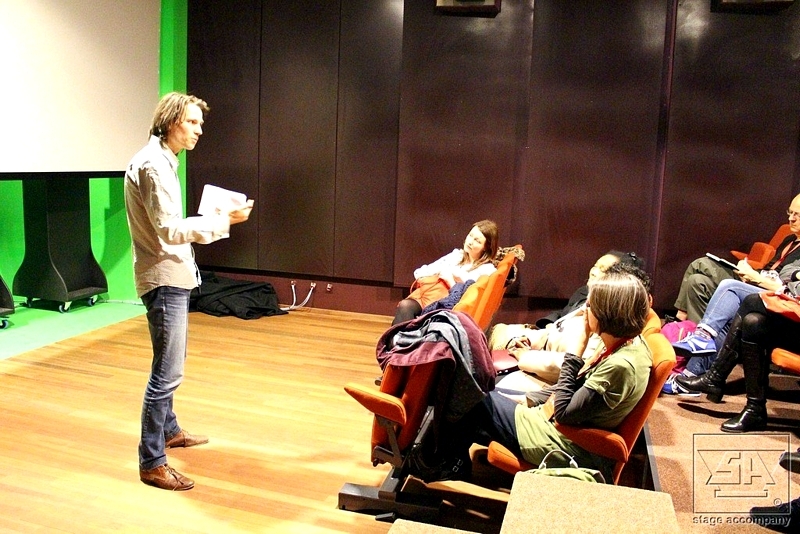 Stage Accompany has upgraded the existing Stage Accompany sound system at Cinemec in Ede. 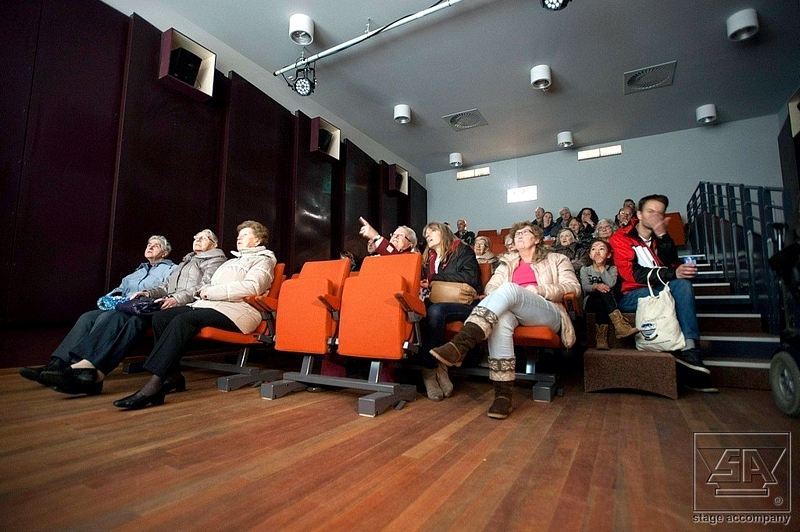 Cinemec is the first cinema in The Netherlands were Barco's Auro 11.1 3D-audio will be used. The existing SA system is extended with SA Digital Series DS50 amps, S26, S7 and F9 speakers for an optimal 3D sound reproduction. The Stage Accompany P2-26 Performer sets which are owned by Prince/The Artist are getting a complete overhaul. After more then 15 years of use they finally did need some recones. Koba Show 2012 Seoul, South Korea. 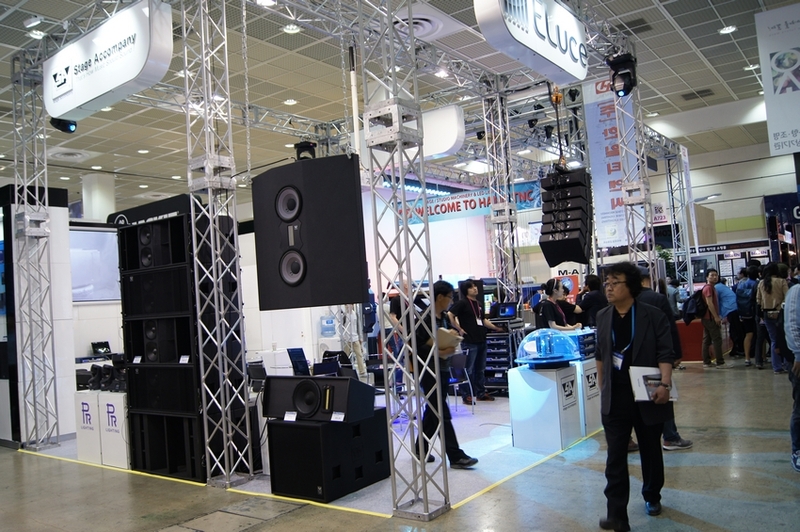 Eluce showed Stage Accompany Pro Audio equipment at the Koba Show 2012 in Seoul, South Korea. 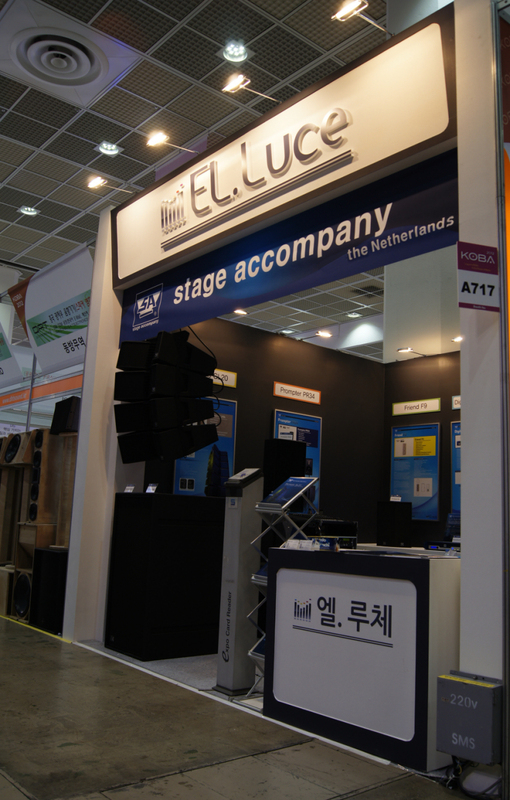 Eluce's Stage Accompany booth at the Koba Show 2012. People of Eluce, SA’s distributor for South Korea, together with SA sales manager Gerard Vermeulen. 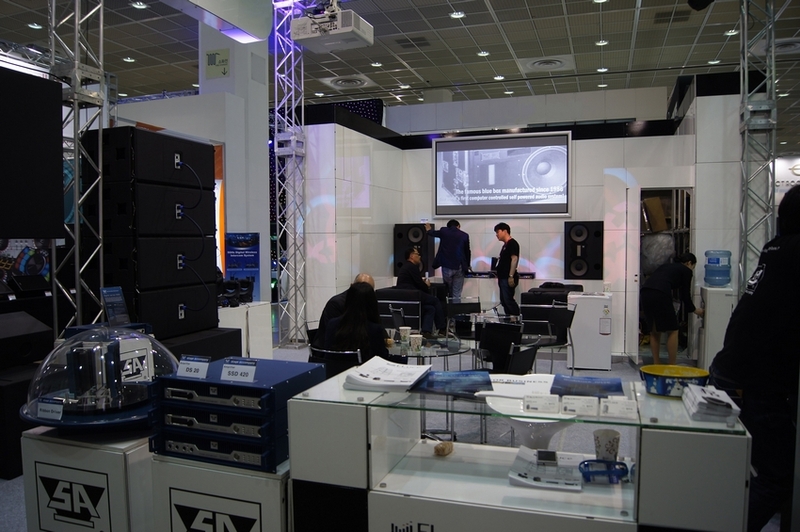 SA’s DS50 amplifier made its Asian debut at the Koba Show 2012. 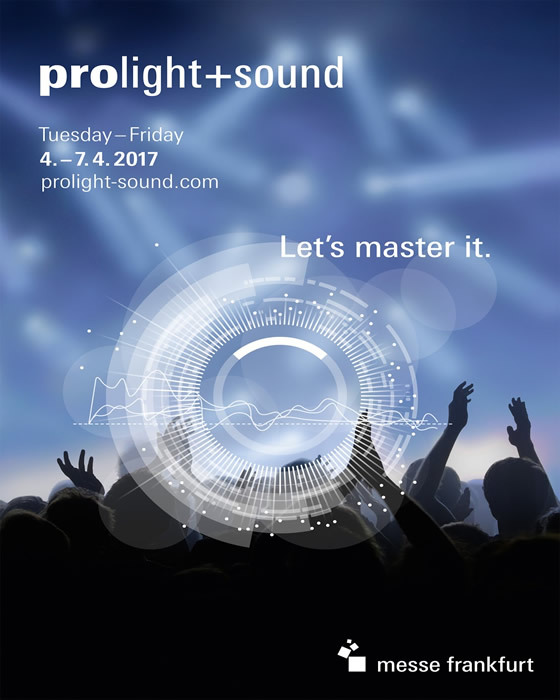 Stage Accompany enjoying a very busy and successful Prolight+Sound exhibition in Frankfurt, Germany. 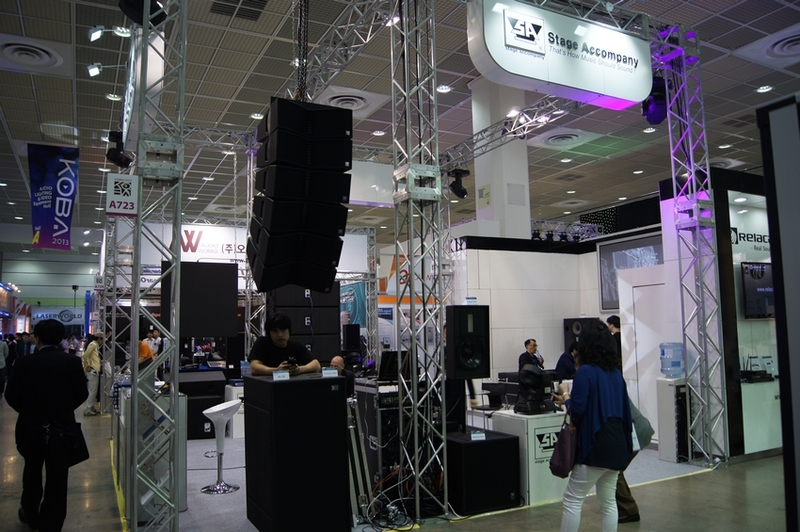 Stage Accompany showed their new products in Hall 8.0 of the Frankfurt Music Messe. 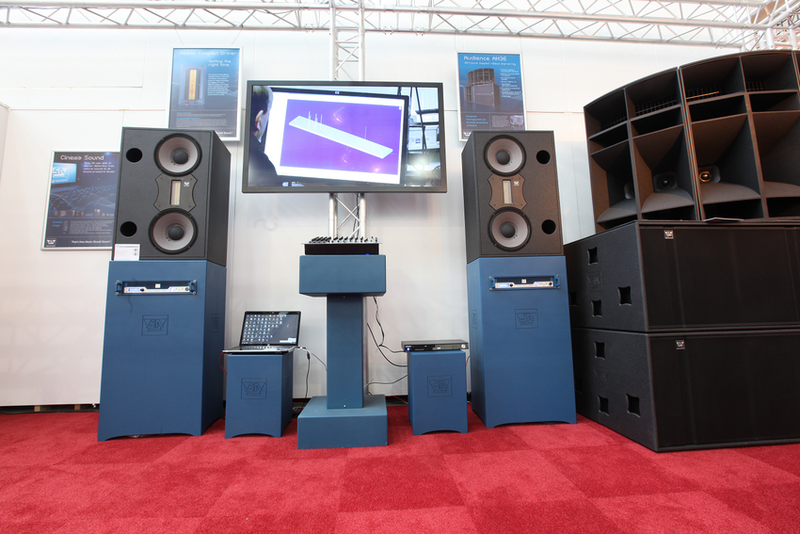 Products highlighted included the new digital amp DS50, GL20b line array, PR34, AH36, AB18 and AB36. 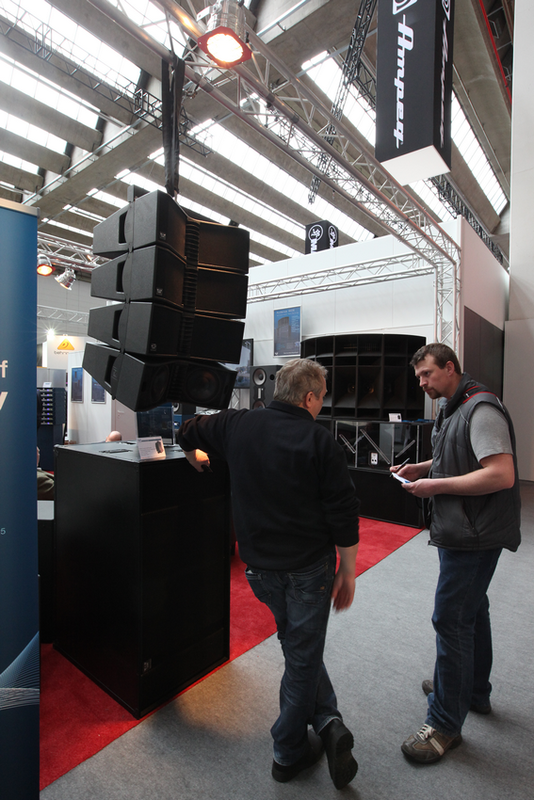 The DS50, GL20b, PR34 and the AH36/AB36 stack attracted much interest. Below an impression of the Frankfurther messe. 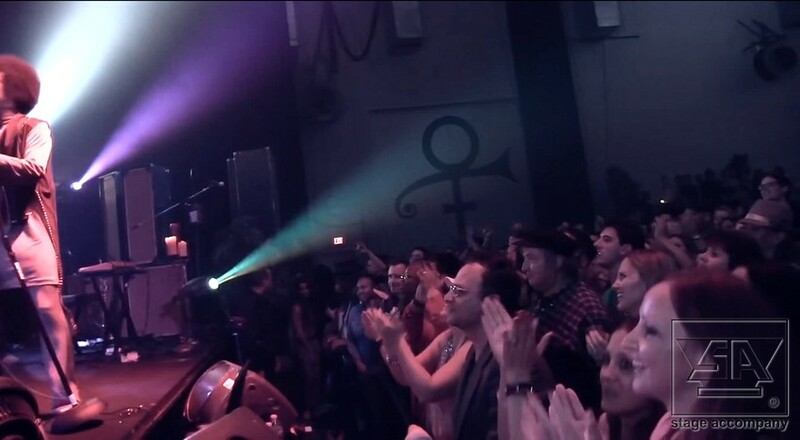 After a period of 15 years Prince is still using his Stage Accompany P2-26 Performer sets. He bought these Performer sets black laminated with gold color grills for his Gold tour in the year 1996. Currently he is using them in his Paisley Park Studios in Minneapolis and for parties, small shows and trainings. Paisley Park Studios is a $10 million dollar complex for recording, rehearsal, video and film productions. The studio - designed and owned by Prince/The Artist - was officially opened on September 11, 1987. 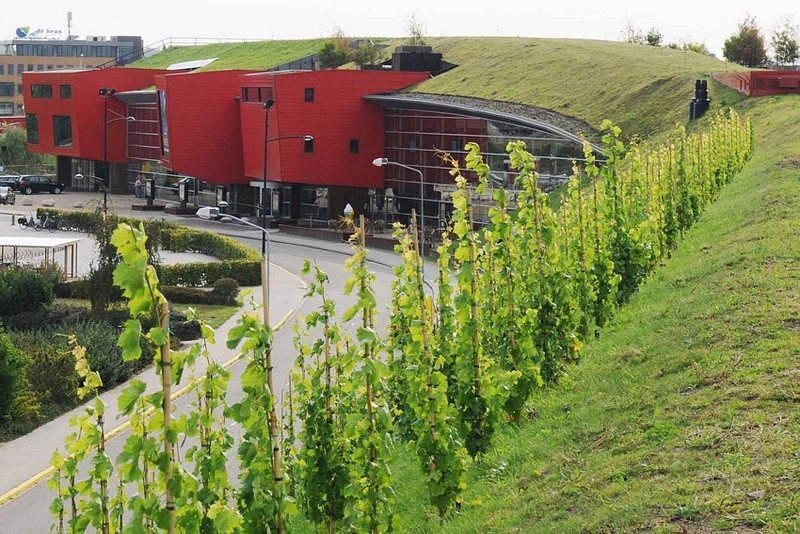 Production capacity Stage Accompany Ridderkerk expanded. Due to the rapidly increasing demand for all products, and in line with the companies expansion strategy for next ten years, strong investments have been made to optimize the production facility in Ridderkerk and to increase the total production capacity. The newly installed Computer Numeric Controlled (CNC) milling machinery not only enables the manufacturing of larger quantities, but quality control has been tightened as well. The brand "Stage Accompany" changed back to Dutch hands. Also the SA logo and website are now registered again in the Netherlands. Would you like to see something amazing? Visit our other company, JMR Waterworld.